SimpleRace provides a comprehensive set of tools to help you create and successfully manage your race. Give us the basic information about your race. What is it called? When does it take place? Where is it located? Having a race with 5k, 10k, and half-marathon distances? Each can have its own entry and price point. Customize the data you collect from your participants. Add a waiver and ensure its terms are accepted before a participant is allowed to register. Tell us where to send your race earnings and SimpleRace will automatically make daily deposits. Invite participants, share your race on social media, and list your race on SimpleRace's public race directory, all from your management console. 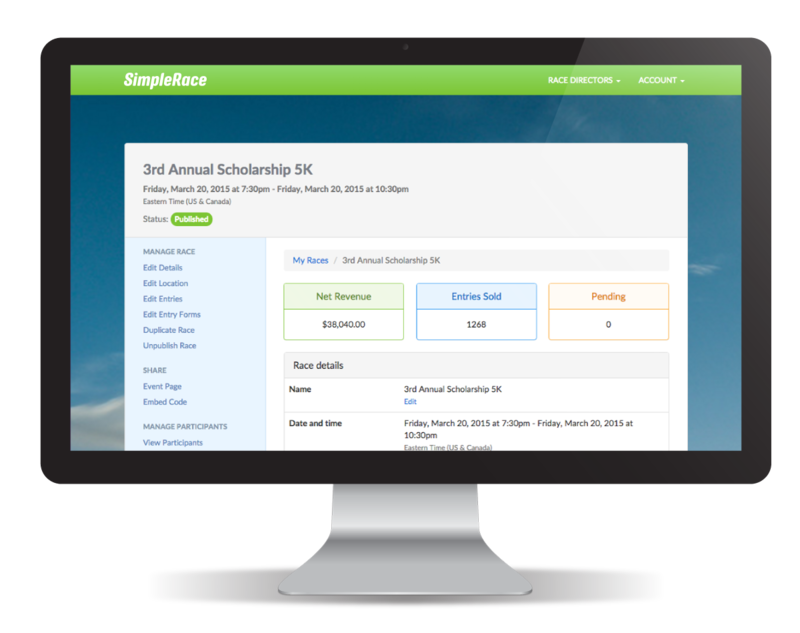 SimpleRace has powered registration for successful events around the nation. Whether you are hosting a local 5k or a multi-sport event on the the world's stage, SimpleRace enables you to sell registrations quickly and securely. We have proudly provided registration for running races (5k, 10k, half marathon, marathon, and ultra marathon), cycling and multi-sport races (duathlon, triathlon, criterium, downhill, and MTB), and fun run races (Mud runs, zombie runs, glow runs). Sign up now and create your race. Create and customize your race registration forms without any technical expertise. Our drag and drop form editor allows you to build robust registration forms quickly and easily. When your registration forms are built, simply copy and paste our code onto your website and your registration will be live.